JACKSONVILLE, Fla.--(BUSINESS WIRE)--Eagle LNG Partners (Eagle LNG) announced yesterday the official grand opening of its Maxville LNG Facility. The plant which has been operating since early 2018 has a production capacity of 200,000 liquefied natural gas (LNG) gallons-per-day with a 1 million-gallon storage tank. 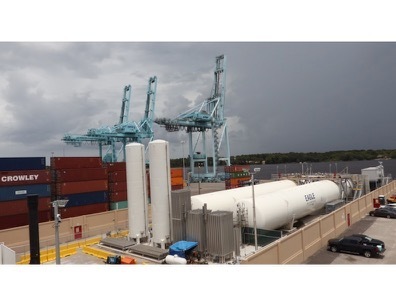 Maxville is built to supply Eagle LNG’s Marine Fuel Depot – Talleyrand located on the Port of Jacksonville’s (JAXPORT) Talleyrand Marine Terminal. Eagle LNG will fuel Crowley Maritimes’ two new LNG-powered Commitment Class ships for U.S. mainland to Puerto Rico trade from its Talleyrand marine fuel depot in addition to serving growing domestic and Caribbean needs for clean-burning, economical LNG. The Maxville plant currently loads LNG in ISO containers shipped to Puerto Rico for the pharmaceutical industry. 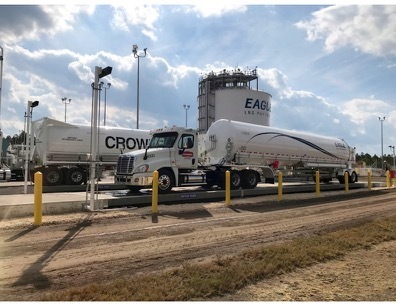 Integral to supporting maritime fueling, Eagle LNG’s marine fuel depot is a shore-side facility offering 500,000 gallons of LNG bunkering capability, while occupying a small two-acre footprint which allows bunkering at Crowley’s berth where their ships are homeported. The fuel depot is the first of its kind world-wide. As a permanent marine infrastructure, it delivers a long-term LNG bunkering solution at JAXPORT for both domestic and international marine trade routes. Eagle LNG’s Maxville LNG Facility and the Eagle LNG Marine Fuel Depot - Talleyrand are significant because each contributes to the LNG infrastructure needed for shipping companies to comply with the International Maritime Organization’s rule which requires the reduction of marine fuel sulfur content by January 1, 2020. Eagle LNG is also focused on completing its larger LNG export plant, also to be constructed in Jacksonville, on the St. Johns River north of JAXPORT. The new plant will have capacity to produce 1.5 million LNG gallons-per-day with a 12 million-gallon storage tank, a marine jetty and road tanker loading bay. It will supply LNG for power generation to the Caribbean Islands plus domestic fuel and power markets. The US Federal Energy Regulatory Commission is expected to approve the larger export facility soon, with first LNG production anticipated from the facility in 2020. Eagle LNG Partners is a wholly owned subsidiary of Ferus Natural Gas Fuels LP and privately held by The Energy & Minerals Group. Eagle LNG Partners is building LNG infrastructure across the United States to supply clean burning, competitively priced fuel for the marine, remote power, rail, oil and gas, and trucking industries. Eagle LNG Partners is based in Houston, Texas. For additional information, please visit www.eaglelng.com. EMG is the management company for a series of specialized private equity funds. EMG focuses on investing across various facets of the global natural resource industry including the upstream and midstream segments of the energy complex. EMG has approximately $15 billion of regulatory assets under management and approximately $10.5 billion in commitments have been allocated across the energy sector since inception. For additional information, please visit emgtx.com.